Despite having almost abandoned his wife and child for this quest, even he has to return to the fold as the Prophus are increasingly being defeated around the world and the Genjix is completely winning the war. The war is now not just over who controls the human race – but whether the planet itself will survive. Jill, Roen’s wife, meanwhile is not quite as confident because of her issues with Baji but has excellent conflict between them. I love Jill and her political wrangling because it shows a version of the war between Prophus and Genjix that goes beyond physical combat and capability (which is Roen’s primary focus) showing both that the war takes place on many fronts and showing us a strong, capable powerful character not just due to their combat abilities (though we also see capable and dangerous female warriors as well making it clear this isn’t a gender role divide). On the flip side we have Tao and Roen, our protagonist where Roen’s life has been pretty much being huge derailed, his family completely disrupted and destroyed all because he follows Tao’s guidance to the exclusion of all else. 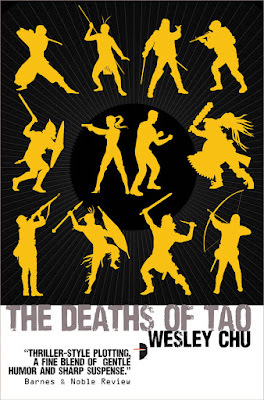 Something we see examined more and more as the book goes on as Tao realises the affect he has had on Roen’s life. Again, despite being a Prophus and Tao very much against treating humanity in such a terrible fashion. We have other excellent examples of a new character who is struggling with his quasing. And then there’s Jill and Baji – and Jill’s difficulty in living up to Sonya’s example who Baji keeps bring up. There’s a lot of complexity here that really feeds into the end result and works with the ongoing theme of whether the quasings are a force for good for humanity – uplifting them in terms of technology and even guiding their evolution against other hominids – or whether a force that is severely compromising human will and causing numerous wars and disasters. These themes all really work together to make the end twist (which I’m certainly not going to spoil) much more than a last resort of the utterly desperate. And it makes me really eager for the next book. In terms of racial inclusion, this book has the same issue with vague descriptions which leave me very uncertain over which characters are POC – including the protagonist Roen himself. Much of the plot does take place in Taiwan with numerous Asian characters, as well as Roen’s own mentor. We also see the Genjix council which includes people of many races from across the planet and we have a Filipino sea captain – none of these are especially prominent characters but the main characters it is difficult to say definitively if they’re POC or not. We continue to have no LGBTQ characters despite a very very large cast. I now look to the next book wondering where this series goes from here because so much has changed so dramatically at the end of this book – including the main character. Whatever happens I am sure the world will continue to be absolutely amazing, the action exciting and edge-of-your-seat compelling with characters who are complex and excellently involved in the many complexities of this brilliant series.